There are many different outlet configuration styles on generators that will require an adapter to connect to the RV. To find the correct adapter, it is important to know the NEMA configurations of both the RV plug and the generator outlet. Sometimes the NEMA configuration can be found right on the generator’s outlet or in the owner’s manual. Most RV’s use either the 30 amp standard, NEMA TT-30, or 50 amp standard, NEMA 14-50, plugs. Please see our list below for some of the more common NEMA configurations found on generators and adapters that will keep your RV connected. Most portable generators have this 3 prong household standard outlet that accepts either a 15 amp or 20 amp 125V plug. While your total power will be reduced due to the outlet’s capacity, it can still be used to provide enough power for the refrigerator, lights, or to simply charge the battery. This outlet is typically used to only power 30 amp RV’s and is mostly used to power the RV from a home instead of a generator. For the NEMA 5-15 configuration, adapters such as the Conntek 14101 are a compact plug adapter solution for any RV adapter kit. Simply plug the 30 amp RV plug into the connector end and then plug the adapter directly into the outlet to receive a maximum of 1,875 watts. To receive the maximum output of 2,500 watts from a 20 amp NEMA 5-20 outlet, you can also use the Conntek 14826 adapter. This pigtail adapter has a NEMA 5-20 plug and a NEMA TT-30R connector, for plugging in a 30 amp RV. This 3 prong 20 amp locking configuration style is rated for up to 125 volts. This outlet has the same maximum power output the NEMA 5-20 outlet mentioned above of 2,500 watts. It can be used to provide enough power for a refrigerator, lights, or charging the battery. Due to the limited amount of power from this outlet, we recommend using this adapter be used with a 30 amp RV. The Conntek 15827 adapter has a NEMA TT-30R RV standard connector and has a NEMA L5-20 plug. Please remember that the adapter is only capable of supplying the maximum wattage from a NEMA L5-20 outlet, which is 2,500 watts. Attempting to overdraw will likely lead to the circuit breaker on the generator tripping. This 3 prong 30 amp 125V locking style outlet is the marine shore standard for 30 amp power. 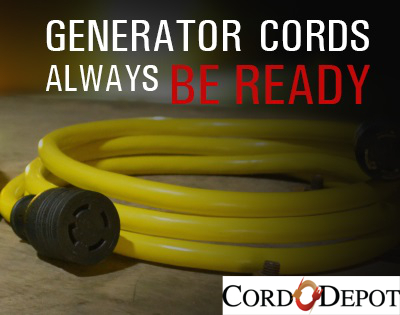 It can also be found on many smaller portable generators as well. The NEMA L5-30 has a maximum output of 3,750 watts, which is the same as the 30 amp RV standard, NEMA TT-30. The Conntek 15825 adapter accepts the NEMA TT-30 plug from a 30 amp RV and plugs into the locking style NEMA L5-30 outlet. This setup allows you to run all the equipment that you could normally use when plugged into a standard RV outlet at a campsite. For 50 amp RV’s, an adapter would work as well. However, due to the L5-30 configuration having only one hot wire, it is important the adapter splits the voltage wire for the two needed in the NEMA 14-50 configuration. The Conntek 15873 has a built-in splitter. Please note that the L5-30 configuration only has a max output of 3,750 watts. If you try to draw more power, the circuit breaker on the generator will trip. The NEMA TT-30 configuration is the straight blade 3 prong 30 amp RV standard. While most 30 amp RV power cords can plug directly into this outlet without an adapter, an adapter would be needed to allow a 50 amp RV to receive power. Similar to the NEMA L5-30 configuration, the NEMA TT-30 outlet has a maximum power output of 3,750 watts and only one hot wire. It is important to find an adapter that splits the hot wire, such as the Conntek 15370. Please note that if you attempt to draw more power than the maximum 3,750 watts, the circuit breaker will trip on the generator. The NEMA L14-20 configuration is a 4 prong, 125/250 volt locking style configuration that is rated for 20 amps. This configuration has an additional voltage wire than the other adapters mentioned above and has a max output of 5,000 watts. For 30 amp RV’s, the second voltage wire is not used as the TT-30 configuration is only rated for 125 volts. Due to only one voltage wire being used, the Conntek 15828 adapter is rated for 2,500 watts. 50 amp RV plugs with the standard NEMA 14-50 configuration have two voltage wires, allowing both to be used for powering the RV. The Conntek 15875 adapter will be able to meet the full capacity of the L14-20 outlet of 5,000 watts. Please note that attempting to draw more power will cause the circuit breaker on the generator to trip. This locking configuration style looks similar to the L14-20, but it is rated for 30 amps and also 125/250 volts. The additional voltage wire gives this outlet a max output of 7,500 watts. The second voltage wire is not used for 30 amp RV’s, as they are only rated for 125 volts. The Conntek 15872 adapter has a max output of 3,750 watts. This adapter will allow you to receive the same amount of power that a NEMA TT-30 and NEMA L5-30 outlet provide. 50 amp RV’s can use both voltage wires to give them up to 7,500 watts. The Conntek 15874 adapter allows the RV to receive the full capacity, but the circuit breaker on the generator will trip if attempting to draw more power. This 50 amp 4 prong configuration style is the 50 amp RV standard outlet. It has a max output of 12,500 watts. In most cases, an adapter would not be needed to power a 50 amp RV if this outlet was already on a generator. The Conntek 15315 adapter plugs into a NEMA 14-50 outlet and has a NEMA TT-30R connector for plugging in a 30 amp RV standard plug. This adapter leaves one of the hot wires empty to give it the 125 volts needed. It is important to monitor the max wattage from exceeding 3,750 watts. If that happens, the power cord and adapter may show signs of melting/burning. Another option for a NEMA 14-50 outlet to power a 30 amp RV is to use the Conntek 14963 Y-adapter. This adapter adds an additional connection for a 3 prong household plug. It allows a 30 amp RV to plug into one connector while also leaving a separate connection for a high powered device such as a refrigerator, air conditioning unit, or heater. Since those devices tend to be the highest consuming ones, it frees up more electricity for other devices inside the RV. For other questions related to RV adapters, please see our blog post, RV Adapter Basics. Does your generator have an outlet that was not mentioned above or other questions that were not answered? Please comment below and we will help you find the right solution to keep your RV powered.